Flash Point Communications are digital problem solvers. So when Team Detroit came to us looking for an innovative video submission platform, we jumped at the idea. To say the least, Flash Point came up with a completely customized, easy to use, and proven total package solution. From user-generated music videos to videos featuring contestants vying for a chance to race Carl Edwards, your Ad Groups video submission site can be customized to fit any idea. Flash Point provides a turnkey video submission package which provides promotional aspects, social media integration, lead generation, monitoring, and metrics. Also, you can keep your brand top of mind through product features which can be displayed while the video is loading, and even provide consumer’s a chance to receive product information (image below). With all the necessities and more in place, Flash Point’s platform saves Ad Agencies and Ad Groups the headache of having to build a video submission website from scratch. This frees Ad Groups up to focus on creating truly unique and interesting video submission campaigns. Through Flash Point’s seamless YouTube integration, video submissions are uploaded in a snap. Not only is it easy for contestants to upload their videos, but it also offers a user-friendly interface which allows administrators to easily approve, deny, and manage uploaded videos. Results speak for itself. 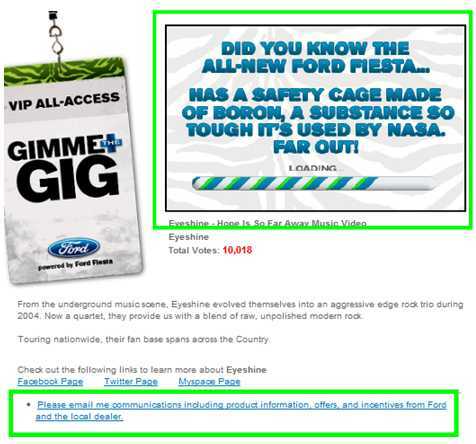 Take, for example, the Western Ford Dealer’s Gimme the Gig band video submission contest. 2,500 submitted videos were sorted and managed successfully over a span of 7-months, generating millions of visits and tens of thousands of leads. Needless to say, “Gimme the Gig 2" was on the minds of client and fans alike by the program's end. For over ten years, Flash Point Communications has been recognized as a leading innovator in the digital media marketplace. With an emphasis on social media and specialization in automotive advertising groups, the firm has established itself as an industry specialist serving the globe’s most respected automotive brands including Ford, GM, Chrysler, Toyota, Honda, Nissan and Land Rover. Based in Newport Beach, California, Flash Point’s 25 employees service clients from four offices nationwide. For more information, please visit http://www.flashpointcommunications.com.